An exhiled tribe of french fry-sized wizards struggles to survive in a small truck-stop town’s fast food joints! An all new comic book series from Starburns Industries Press presented as a side-dish to B-Squad. Known as “The Wizard” in the former world, this exiled fellow is cut off from the rest of the magic users that have taken roost in the various fast food restaurants in the city. Serving as an all-powerful wizard’s familiar is a difficult task. 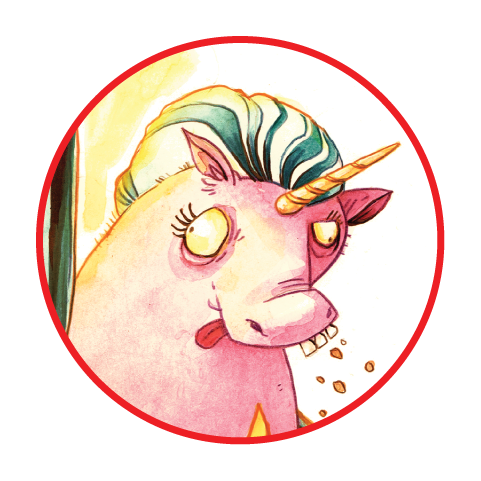 Hugo serves his master dutifully, but the frequent experimental spell-casting have left Hugo in a less-than-standard state as a handsome unicorn. Tiny Wizards is currently scheduled to be released as a side-dish comics to B-Squad missions set to be published by Starburns Industries Press in the Summer of 2019. B-Squad missions are widely available for order for local comic book stores and select online retailers like Amazon, Target, and Barnes & Noble.